Neopolitan ice cream is popular for baked Alaska. If you've never had gourmet desserts, you may find yourself asking "what is baked Alaska?" when you see it on the menu. While it is a simple dessert, there are actually many types of baked Alaska and it can be whatever dessert you want it to be. Simply put, baked Alaska is a hot ice cream dessert. The chilly ice cream center is surrounded by a thin cake layer on the bottom and a thick layer of meringue on the top and sides, both of which effectively insulate the ice cream against the heat of the baking that gives the dessert its characteristic carmelizing on the meringue. Most often the dessert is baked briefly in a very hot oven or under a broiler to firm and carmelize the meringue, though it is also possible to use a hand torch like what you would use to carmelize crème brulée. The exact origins of baked Alaska are unknown, and several different references to similar desserts can be found throughout the nineteenth century. The origin of the familiar name; however, can be traced to 1876, when Delmonico's Restaurant in New York City unveiled the treat as a tribute to the Alaska Territory. In addition to baked Alaska, similar desserts are also known as glace au four, Norwegian omelettes, and omelet surprise. Today, baked Alaska is a popular gourmet dessert and is often served on cruise ships, at holiday dinners, and at upscale restaurants. Fortunately; however, the dessert is also easy enough to make that you can serve it in your home whenever you wish. Pineapple Baked Alaska: A unique variation that uses pineapple shells instead of sponge cake for a tropical treat. Lemon Meringue Baked Alaska: Citrus style Baked Alaska using vanilla wafers and lemon sorbet for a zesty lemon dessert. Individual Baked Alaska: Wolfgang Puck recipe using pound cake for individual Baked Alaska servings. 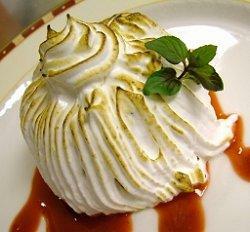 Minty Lime Baked Alaska: A true gourmet treat with unusual ice creams and angel food cake. Chocolate Baked Alaska: A chocolate-lover's treat with a brownie base and mocha ice cream. Choosing different ice creams to coordinate with the occasion, such as peppermint ice cream for a Christmas treat or bubblegum ice cream for a fun and colorful birthday surprise. Opting for different types of pastry instead of simple white cake. Brownies, large cookies, chocolate cake, pound cake, angel food cake, or any other cake flavor can be used. Pastry dough and pie crust are other options as well. Topping the dessert with unique garnishes. Chopped fruit, chocolate sauce, fruit puree, mint leaves, sprinkles, and chocolate shavings are all popular choices. For a more gourmet and dramatic dessert, top the meringue with a splash of rum and flambé the treat. While this is a simple dessert that is easy to make once you've tried it, there are tips that can help it be even easier to create. Freeze the cake before topping it with the ice cream to provide even better insulation when the dessert is heated. Chill the plates the dessert will be served on to keep the ice cream from melting too soon. Keep the ice cream frozen as hard as possible until it is needed to assemble the dessert. Be artistic with the meringue topping by creating swirls, peaks, or ridges that will show off the browning. Garnish the plates with a swirl of dessert sauce or add other accents. 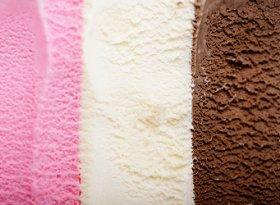 If using Neapolitan ice cream, slice the dessert so all the flavors can be seen. If using a single ice cream flavor, consider making individual sized desserts rather than a larger confection. Serve the baked Alaska with an extra scoop of ice cream or slice of cake, especially if there is extra from making the recipe. The question isn't "what is baked Alaska" but rather "what isn't baked Alaska," since this easy gourmet dessert has many variations to suit personal tastes and different occasions. From a simple treat to subtly coordinating flavors, this dessert is one you can make many times and always enjoy anew.